In order to open the Test Results panel, click in the Main Menu: View ⇒ Pads ⇒ Test results. methods — separate test methods, which the test class includes. Every of these levels, excluding methods, can be expanded. Queued — the test job is in a queue on Salesforce. At this stage, the classes have the status 'Queued', but the status of the job is 'In Progress', and the classes can't be expanded. In Progress — the test job is running now. The test job has this status until at least 1 test method is in progress. At this stage, the classes, which are in progress, can't be expanded. Aborted — the test job is canceled. 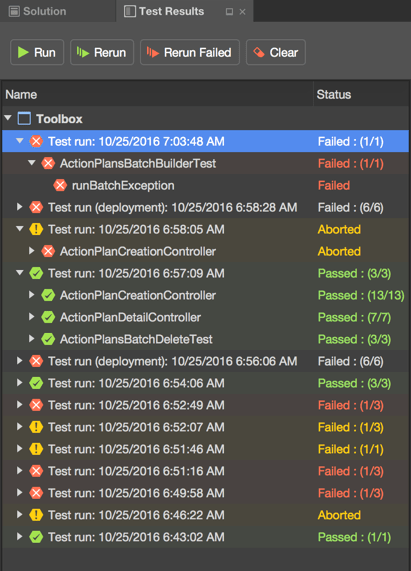 You can expand a test class and see the results for those test methods that have been finished. Passed / Failed — an actual test result. At this stage, you can expand any test class and see separate test methods in this class. Failed: (X/Y) — there's at least 1 test class in a job or 1 test method in a class that failed. X is the number of failed items, while Y is a total number of items. Passed: (Y/Y) — all test classes in a job or all test methods in a class are passed. NB: The test statuses aren't available for the deployment validation test-run while it is in progress. In the Test Result panel, you can find all the details related to a test class or method. If you click on the test class, below the list of the test you will see the name of this class and the test result. If you click on the test method, you will see in addition a message and a stack trace if the test method has failed. The Test Result panel also allows you easily navigate to the code lines of the test classes or methods right in the editor. 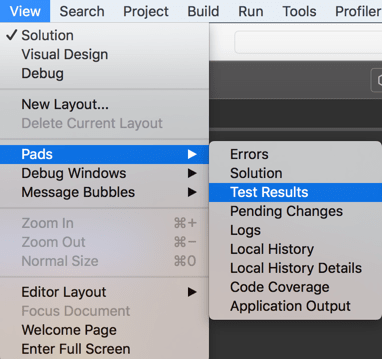 In order to do this, you just need to double-click on a test class or method in the Test Results panel. If you click on the test class, the necessary class file will be opened. If you click on the test method, this file will be opened, and a caret will be placed on the part of the code, which contains this test method.